October 1922. New York. 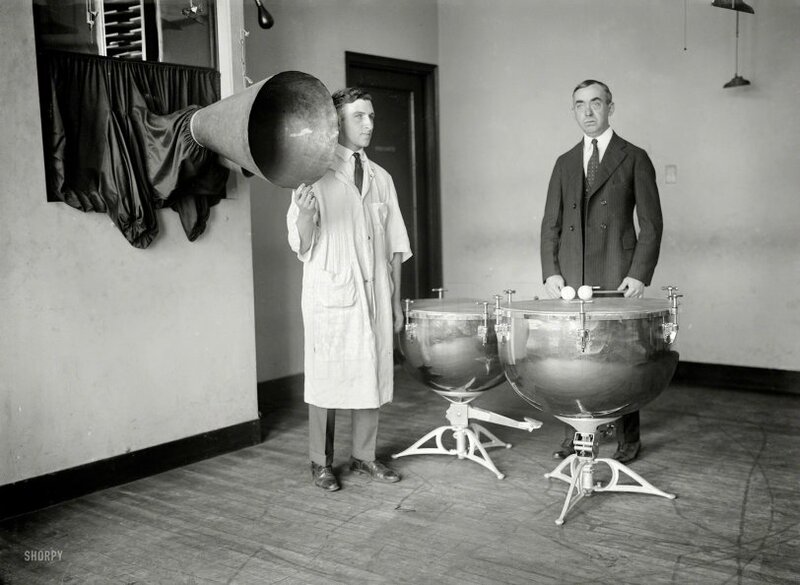 "Kopp" is all it says on this glass negative depicting a pair of kettledrums next to what might be a speaker horn or a mega-microphone. Bain News Service. View full size. Submitted by aenthal on Fri, 07/08/2016 - 3:09pm. The first commercial electrical recordings date to 1924/1925. Before that recordings were made with acoustic recording equipment. In other words, physical horns gathered the sounds and cut the sound vibrations into wax. So what you are looking at is the "microphone" (though it would not be called that until recording was electrical) of an acoustic recording studio, with the cutting machine behind the curtain. Submitted by joemanning on Fri, 07/08/2016 - 2:23pm. Submitted by rhhardin on Fri, 07/08/2016 - 2:18pm. Maybe they're measuring the absorption of phonons.